Shangri-La Hotel Paris is a 5-Star luxury Hotel located at the heart of the city with the legendary Jardin des Tuileries just around the corner its the perfect place to indulge whilst in the backdrope of the dazzling effel tower . When the Shangri-La Hotel opened in Paris at the end of last year, it marked the first incursion by an Asian hotel brand into this innkeeping mecca. Fitting, then, that the Hong Kong-based group should be housed in a palatial property: the former residence of Napoleon Bonaparte's grandnephew, Prince Roland Bonaparte. The 1896 landmark was painstakingly restored over four years, its salons and reception halls — with their frescoes, gilt work and chandeliers — returned to their former splendor. Afternoon tea is held in the airy La Bauhinia restaurant, named after Hong Kong's official flower. It offers a unique ambience in the heart of the hotel. Inspired by the bauhinia flower, the restaurant is a reminder of Shangri-La Hotel's roots in Asia. Scones, minis pâtisseries et une sélection de finger sandwichs accompagnés d’une boisson chaude de votre choix. Scones, small pastries and a selection of finger sandwiches served with a hot beverage of your choice. Aftertoon tea classique accompagné d’une coupe de champagne brut ou rosé. Traditionnal afternoon tea served with a glass of Champagne brut or rosé. 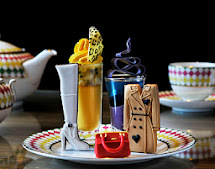 François Perret, pastry chef, created a cupcakes “collection” wich will be renewed every season.